Happy Holidays! I hope everyone had a great Christmas...I sure did! My husband and I just got back from Mammoth last night (hence the lack of posts over the past few days) and are preparing to leave for Utah tomorrow night. We can't seem to get enough snowboarding! 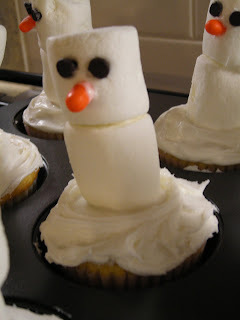 I made these snowmen cupcakes about a week ago. They were very simple to make. I used a yellow cake mix and vanilla frosting. 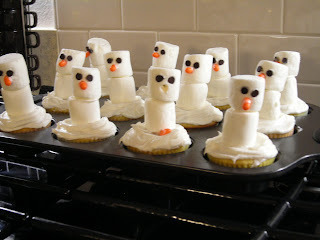 For the snowmen bodies I used jumbo marshmallows. I put a little frosting between the marshmallows to hold them together. I wanted to use mini M&Ms for the eyes but I couldn't find any at my grocery store. Instead, I used mini chocolate chips for the eyes and orange tic-tacs for the noses. Next time I think I will use those straight pretzels for arms. I researched a few cupcake shops in Utah to possibly stop by when we are there. I hope to come back with some great reviews! See you in 2009! Those are very cute! Happy Holidays! those cupcakes are so cute! good luck in utah! Becky- Thanks for the advice! I went to Diva's and was very impressed! Look for my review soon. miss l- I know what you mean about cupcakes being against the diet. That's why I love mini cupcakes...I can eat one or two and not feel so bad. I have heard about Frosted Cupcakery from several people but have not been there yet. It's definitely on my list of shops to visit soon! Thanks for the heads-up!